M&Co is to become a Superdrug. At least it's not another estate agent I suppose? I feel a bit sad that M&Co is leaving. Rather useful for getting pants & socks for the kids! sad loss- I only hope the arrival of Superdrug won't impact on our lovely local Boots. But then I suppose Superdrug is more about cosmetics than pharmacy isn't it? Surprised they'd chose to open here, isn't there a big branch in sydenham? Superdrug say they'll be opening on 29th September. There is a big branch in Catford too. Will the writing be on the wall for Forest Hill Boot's branch? Maybe it will give Boots the kick in rear to drag it into the 21st Century. Does anyone know what's happening to this. The shop has been empty for some time now and is becoming a serious eyesore. agree-it looks bloody awful with all the flyposters and homeless in doorway. Opening due date 29th September. Well 29th September has come and gone and no sign of any occupation or conversion. Can the freeholders be made to clear up what has now become an eyesore? Apparently, Superdrug are looking into it when a dozen or so people contacted them asking what was going on. On Twitter, they were still adament it was opening up on time, including on the day it was due to open - until people starting sending pictures of postered windows, and graffiti. I understand the complexities of opening a new store. I've been there myself, and know only too well the amount of organisational planning that goes into something like this. It's not a small job, especially when having to deal with legal requirements, and dealing with third parties. However, Superdrug have been unreasonably quiet on this, and keep promising to get back to people asking questions but never do. They also advertised for job roles for the new store so there's people out there still waiting for some form of communication that just hasn't happened. What's a little concerning is that we're not that far away from Black Friday, and ultimately Christmas. Either they deal with all the issues at hand before then, and perhaps rush staff in to deal with it, or complete it for the new year. Personally speaking, the latter would now be the better choice. It takes time to train staff up to a competent standard, but even more so when it's a new store. If it was me, I'd now be aiming for a 2018 launch where they won't have to worry about all of this. If I hear anything moving on this, I'll be sure to post it on here. Very curious as by no means could the building be described as a pub! Obviously, whoever it is that's done this, probably carries a good dozen or so of these and puts them up every time he/she settles in. I'm guessing a pub is their usual MO. If Superdrug had got their finger out months ago, they probably wouldn't be in this situation they're in now. I see that there's a court hearing on 26th October. Hopefully once the freeloading soap dodgers are out, we'll see work progress. 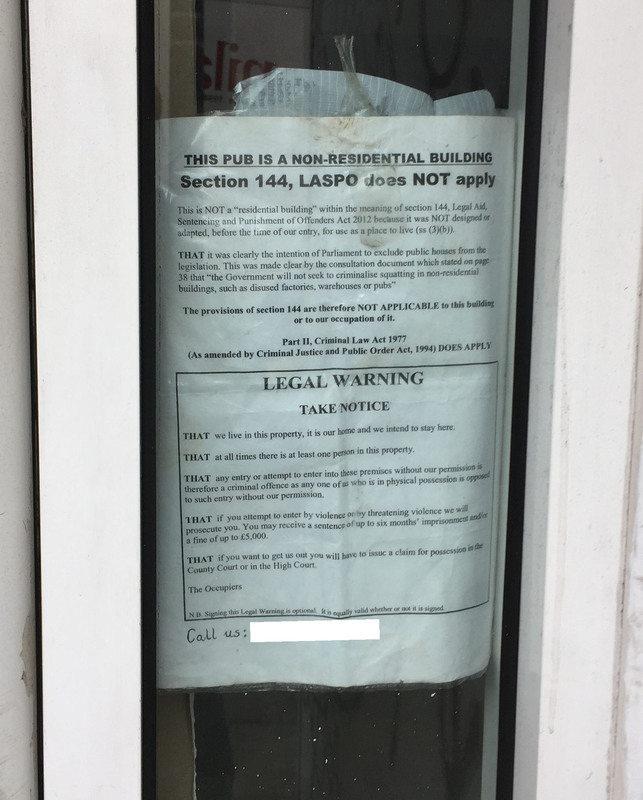 Notice on door that the property has been repossessed. Hope Superdrug now get their act together for opening asap. I do hope that this hasn't put the tin lid of them coming to FH. There was a chap there yesterday evening scraping all the posters off of the windows so someone is doing something. Don't give up hope just yet!